Love Song and Primrose are entertaining a gentleman caller! Comanche from Rosebay Ridge Farm is here visiting for a week. That means that we are now taking reservations for April kids! Excited for Primrose's first freshening! Summer has come and gone without a website update. Whoops! The baby goats were a joy, but they have since gone to their new home. It was sad to see them go, but we're happy they've gone to a good home. See the kids page for photos. 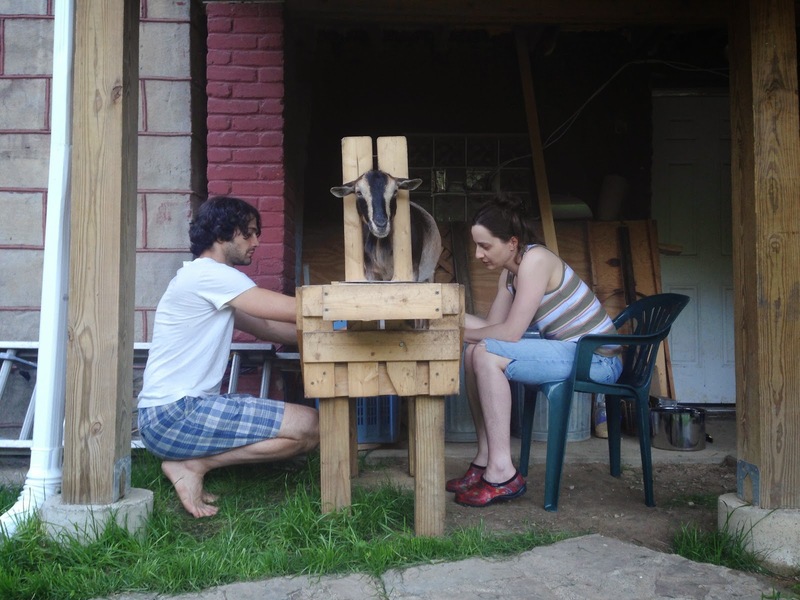 It's also been great to have fresh goat's milk every day! Love Song didn't like getting milked at first, but we are all now used to it, and she enjoys jumping up on her milk stand to get her breakfast and dinner. We're hoping to breed both does this month for spring babies. Stay tuned. Love Song kidded on March 24th. The birth went quickly and smoothly. Sadly, one buckling was a runt and only lived a day. A sorrowful day here at Arlington Acres. However, we are joyful that the doeling and other buckling are happy and healthy and growing fast. They are unbelievably adorable and love to run and jump. Their new mommy has come to visit and we're happy that they will be going (together) to such a good home. Here are some videos and we'll be will be adding more photos to the album. We've got all our birthing gear ready and some reservations lined up. Love Song had her 'pregnancy clip' today and we're going to set up the birthing area of the barn soon. Her udder is coming in nicely. How many kids do you think are in there? Unfortunately, we found out that Primrose's breeding did not take, so she is not pregnant. We will try again this summer or fall after Love Song's babies go to their new homes. Baby Goats on the Way! We have confirmed that Love Song's October breeding was successful! We will have baby goats in March or April 2014. We hope to breed Primrose soon for June kids. Check out our breeding schedule to reserve your kid!